Thomas has become a favorite friend of many of our children and appears in toys, books, videos and his own feature-length movie. 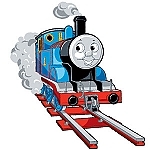 Train Party is pleased to launch a dedicated section just for Thomas the Tank Engine games and puzzles. These award winning Thomas games and puzzles are from the very reputable manufacturers in the industry and are loved by families as it promotes learning and fun for their childrens. All Aboard!